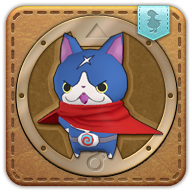 Summon your Hovernyan minion. He may be a wanderer, but he's actually quite dependable. Although he is floating, he is actually very down-to-earth. The white mark on his forehead is an honorable battle scar.